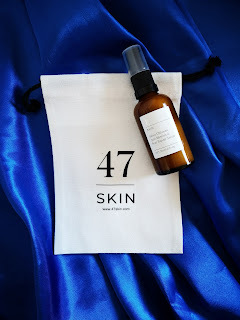 I've been testing out the Silver Chitosan Anti-Blemish & Scar Repair serum from 47 Skin for a few weeks now so thought I give you a quick review. So who are 47 Skin? They're a new British skincare founded in 2017 and they came about as a result of an accidental scientific break through! Whilst conducting another experiment, a scientist mixed an atom of silver with Chitosan (a naturally occurring substance) which created an antibacterial formula that has some other amazing properties. Now I've heard of silver being used in plasters to aid healing and in PJ's designed to be worn in hospital to help stop the wearer contracting MRSA, so I was really intrigued to hear how this applied to skincare. So what does it do? It helps reduce inflammation, breakouts / acne, signs of aging and is also helps the regeneration of skin cells. Sounds great doesn't it? Now here's the really clever bit - the silver bonds with the Chitosan to produce a polymer film so you get a layer of protective silver one atom thick. Chitosan works on skin in a similar way to collagen by plumping it and creating a surface for new cells to grow. 47 Skin have brought out 4 versions of serum - Anti-Blemish & Scar Repair - which I've been using, Age Defence, For Him and the original Regenerative serum. All include the all important patented silver Chitosan formula. All are designed to regenerative surface skin cells, promote healing, help reverse environmental damage to skin, help soften the appearances of scars and create a protective barrier in the skin. On to the serum itself... It comes in a glass bottle with a pump, I've found one pump to be the perfect amount to cover my face and neck. I was surprised at the consistency, it's quite a thin, runny emulsion. This makes it incredibly light and easily absorbed. Skin literally drinks it up which means it works well being used in the AM under makeup, as well as PM. I've not had any issues of pilling which is always a bonus! There's no residue or tackiness left behind after use. Fragrance wise it smells gorgeous! Light and fruity, thanks to a few essential oils. So how well does it perform? Well for initial effects it works well to hydrate and plump skin. I've not seen a reduction in my acne but as it's hormonal, I didn't expect to. I have however seen improvement with my acne pigmentation scarring. As my acne is cystic, it's usually deep under my skin and rarely comes to a head. But it always leaves bright red marks which last far longer than the spot itself. They're a huge bug bear of mine as they're hard to cover, even with makeup! I've had one really stubborn mark on my chin for weeks now and it's vastly improved since using this serum - I'm very impressed! Anything that will improve my acne scars is a winner in my book! I'm excited to see the longer term effects of using this serum, especially on my acne scars! This site uses affiliate links which means if you click on them to get to a brands website and make a purchase, a small commission is passed on to me (Toria). This does not cost you anything. Using an affiliate link is a great way to support my blog and is hugely appreciated by me. It's great to know my reviews are being put to good use! I'll always clearly state on each post if the links or codes are affiliate. These links in no way alter my opinion of products or bias me in any way towards a brand. My views are as always, honest.